So we finally got some rain yesterday - right around dinner time (fortunately, we ate a little early, or I would have been grilling the chicken during a downpour). The storms were discrete cells that blew through quickly - pretty typical of this area. As the storm approaches, you can see the dark clouds in the distance, even though the sky above is bright blue with puffy clouds. And once the storm passes, we often experience clear skies again, sun showers and rainbows. No rainbows tonight, but I thought I'd share some of the pictures I shot right after the storm passed - to give you an idea of how the light creates impact. The sun is directly behind me. I know this is what I was taught when I took an introductory class to photography (in 4th grade) - always have the sun behind you so your subject is appropriately illuminated. Sure, the subject is illuminated. And boring. So I move 180 degrees and I am facing the sun and the leaves are backlit by the sun's rays. My eyes can make out a pleasant view of the backlit leaves, but that didn't translate so well to my camera's sensor. Just another "meh" result. 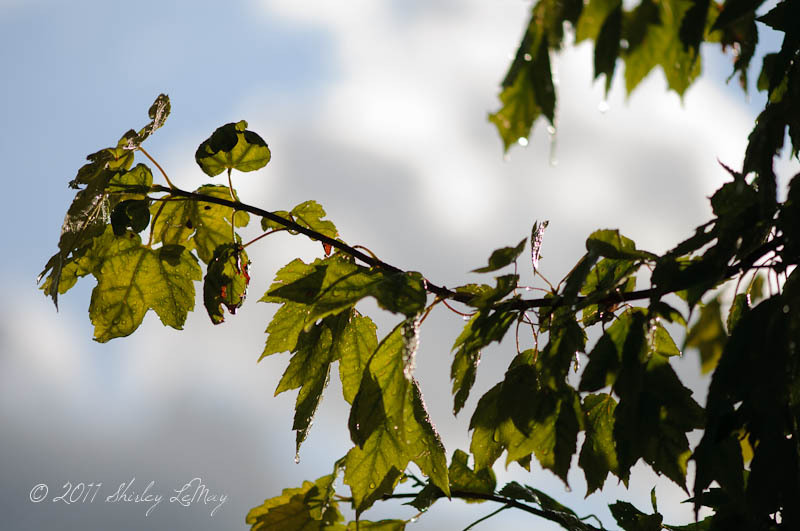 I want to capture the rain drops glistening in the sun. So I move again, still facing the sun, but this time isolating a single leaf and positioning myself so that I can see the light through the leaf. 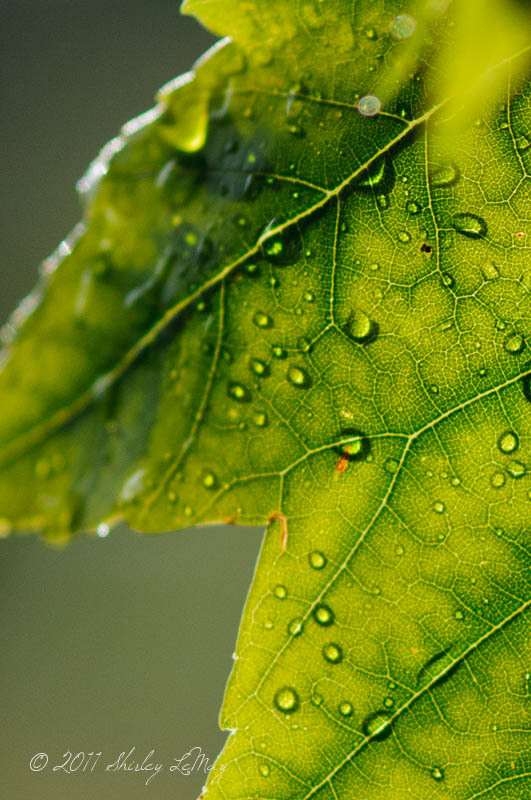 I really like this capture, although it would be better if I hadn't cropped off the bottom tip of the leaf. 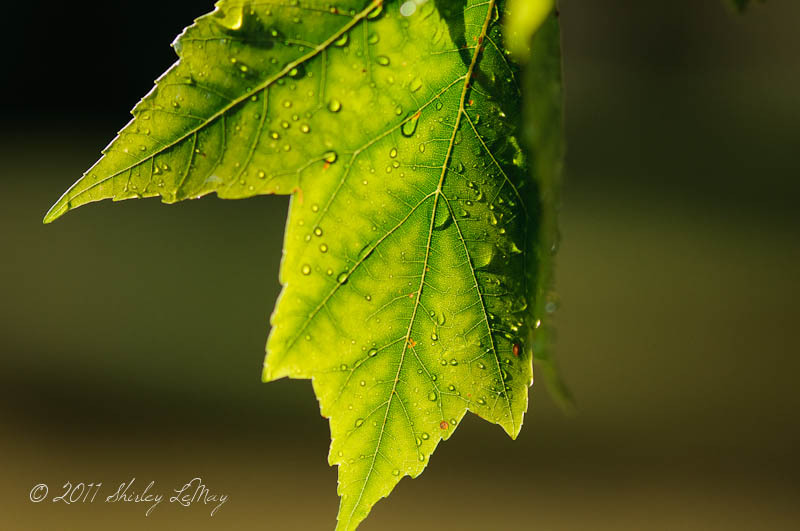 I went on to shoot some more of the leaf, using vertical orientation, but none were as nice as the shot above. I did crop one of the photos really tight - to get really see the detail of the leaf. One more thing to note about this photo shoot - it lasted all of five minutes. Because within that time, more clouds rolled through and the golden sunlight was no more. Once the sun was gone, I stopped shooting - without the light, I wouldn't be able to capture what I wanted. 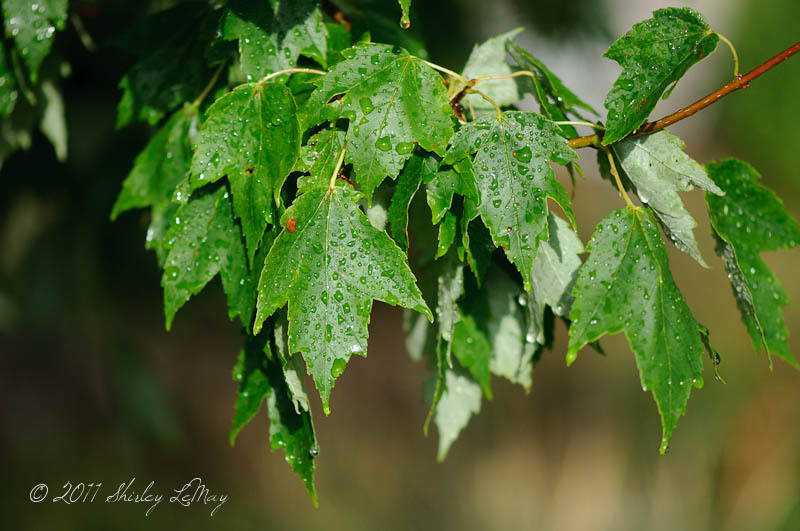 By moving around, taking advantage of the light and getting closer to my subject, I was able to capture what brought me outside after the rain - the glistening leaves after a much needed rain. I still like the composition even though it's cropped. Love the light! I love the light and the green. Stunning.